I have been getting some emails about whether I have seen Casino Royale yet, and if so what I thought. 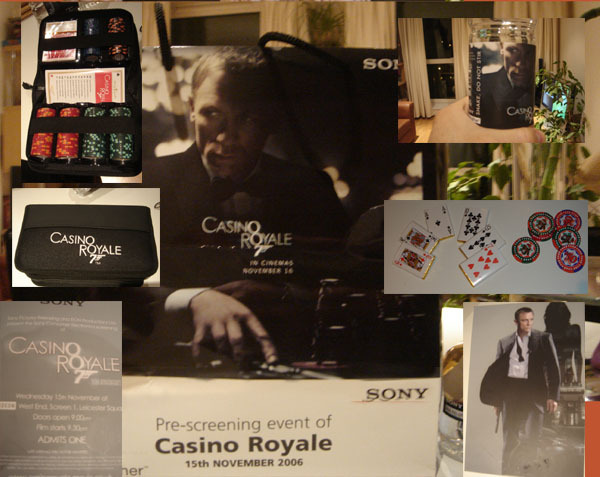 - & Casino Royale poker pack. 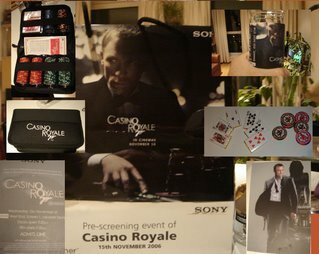 With authentic Casino Royale chips and cards as seen in the film. After some deliberation I'll be holding onto these babies as a keep sake, foregoing the £500 offer. Yes, I saw Casino Royale last week. It's good. Go see it. Support Daniel Craig and they'll make more good Bond films. Ok so to truly understand Bond we have to accept that all males (I can only speak for males in this instance) have an inner voice that guides them through their everyday. No I'm not speaking about the voices that tell you to do bad things, those voices not covered in this entry. - religious figure e.g. "turn the other cheek"
or David Beckham, Tyler Durden, Donald Trump, some guy in a film etc. The voice could be that of complete reason such as a father, teacher, lecturer etc. Or even a comic character such as Wolverine, Batman or Superman. My inner voice happens to be James Bond on occasion. So next time you ask me a stupid question and I look like I'm about to pistol whip you, down a Vesper (Vodka martini) and drive through the streets recklessly at high speed. You know why. Ok so I'm introduced to Sean Connery around 1974/5. He is as an elderly, bitter, arrogant, misogynistic, women beating, aggressive, funny dressing (this was South Africa and I was about 5 years old) villain. What! oh he's the hero of the piece. Well actually I thought he was worse than Auric Goldfinger he matches the criminal on all counts, deviousness, cunning and viciousness. Except he works for the Goverment. By 1977 I was taken with the casual swagger of Roger Moore's secret agent. He was dashing had cool gadgets and cars and was by far the most American Bond I had seen. My favourite Bond film at the time was The Spy who Loved me. Then Moonraker was released. Wait a minute -its the same film, the same formula, even some of the same characters - just in a different setting. Well this goes on for a couple of years by the 80's I was starting to appreciate that the franchise had become a parody of itself and it forced me to revaluate some of the early Bond cinema. Dr. No, Thunderball. Whoa new favourites, these were the business. A couple of the Bond books found themselves on my reading list. Daniel Craig - Spot on, closer to Ian Fleming's blunt thug with a little Connery shaken in. Ok so here we are 2006 - 007 is back in Casino Royale. Ian Fleming's first James Bond book. The film is relatively well adapted. A lot more than other Bond films. Daniel Craig is good - young, more dynamic (than imagined) and unafraid. Everything a Bond should be. In the absence of Sean Connery indelible impression. I would say the best. All the books characters are here. The girls, villains, sidekicks and allies. 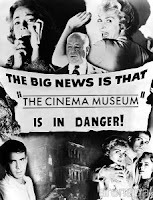 The film has been admirably updated to a contemporary setting. It really is James Bond: Year One - Casino Royale. This is a technique made popular by comics. They reinvigorated a lot of the story arcs by reengineering the origins of the characters, updating them and adding additional bits of motivation and hero mythology. The gadgets have been toned down. Not gone, just toned down. Loads of Sony product placement. The locations are different - South of France is now Montenegro. Bonds relationship with M is fleshed out and definitely not what you would expect of a professional relationship. One of the plot devices for the film is that we are not introduced to SMERSH* or SPECTRE*. This will know doubt be rolled out throughout the new Bond series. Hopefully Sony will not play their hand to soon and reveal the criminal network, or its head Bloefeld to soon. Rather Bond works his way through the organisation to reveal Bloefeld over a couple of films. With occasional elusive partial appearances being made every now and then. There are clear parallels between Al-Qaeda and the mystery organisation behind events in Casino Royale. *In the James Bond film series, Bond's archenemy became SPECTRE, first used in Ian Fleming's novel Thunderball (film-wise, SPECTRE is mentioned in the first Bond movie, Dr. No). Film versions of novels in which SMERSH was featured either substituted them with SPECTRE or made the villains independent operatives. In truth, SMERSH never really makes an appearance in the James Bond film franchise at all, although it is referred to twice. In the film From Russia with Love, Bond initially thinks he is fighting SMERSH, only to find that the villains are actually working for SPECTRE; this includes the villain Rosa Klebb, who was formerly a SMERSH operative, but who has secretly defected to SPECTRE. In charge of counterintelligence among Soviet organizations at home and abroad. Investigations and legal work. Personnel. Prosecutions — the section which passes final judgment on all victims. This will be more important as the series continues as all the villains are in one of the above departments. Although Casino Royale is Bond 21 there have been 24 Bond films. 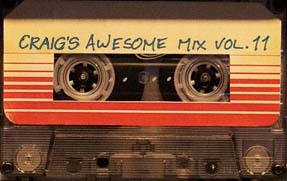 I have not included the original Casino Royale or should I say the original Austin powers. In much the same way as Bond begins was the working title for Casino Royale. Risico is the working title for Bond 22. South African movie maker Roger Michell walked away from the chance to take charge of his first James Bond film after talks with producers fell through. "Creative differences" prompted the South African to give up on the project. In case you had any doubts Bond is back.